L.L. Bean, almost a century old business began as a store, then progressed to catalogs and has kept up with the times by combining catalogs and eCommerce. Surely Leon Leonwood Bean, who was an avid hunter, trapper, and lover of nature had no idea what technology was in 1912 when he designed a pair of lightweight boots to protect his feet from the elements. The boots became known as the Maine Hunting Shoe, and for the time period where there was a definite need for outdoors men, the product was a revolutionary development. Bean’s original strategy for direct-mail marketing consisted of five simple lessons he learned while revolutionizing his business plan. Plan for the long run if you want to run long. The Maine Hunting Shoe was well made, traditional, durable, and classic in appearance. Care for your customers to keep them coming back. He employed quality merchandise, reasonable mark-ups for profit, 100% money back guarantee, hours 24/7, and a postage paid return policy. Get hands dirty once in a while. Bean was always talking to customers and doing trial runs of his new products. Today Bloomberg Business Week ranked L.L. 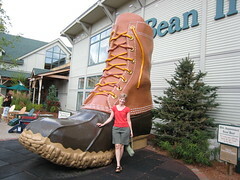 Bean number one “customer service champs.” So how did this Freeport, Maine company boost their ranking? The company has been congratulated for the design of their website, their return policies, and for staying in Maine. With a very popular and effective print catalog, the company publishes product reviews from their website into their catalogs, and according to public affairs representative Carolyn Beam, catalogs are still very popular. “People love to shop by mail. The catalogs come a few times a year, but throughout the pages customers are asked to sign up for email newsletters. They may be lighter and less pages, but they are still popular,” explained Carolyn. The company follows up with modern technology and sends email notifications out all year-long notifying consumers about sales. Customers are encouraged to order online, mail in orders, or even phone in orders. The toll-free numbers offer convenient options, however their promise to answer the phones on the first two rings didn’t happen (no big deal however this is the winter sale time and the phones are humming). I was able, however to click on their “Live Help” button and contacted customer service representative Michelle who was very responsive, helpful and polite. Most impressive is their 100% guarantee. Customers can return anything they purchase; “rock solid guarantee of satisfaction.” In the early years, Bean had a lot of people returning merchandise, but despite his narrow margins at the beginning of his developing business, Bean never compromised his work ethics. The company is still privately held and family owned. « Do toll-free numbers help customer service?